Understanding pain is the first step toward pain prevention, control and treatment. This document was created to highlight our knowledge with regard to pain, and pain transmission pathways. Complicated, but extremely fascinating. Pain is derived from many sources. Dr. Kressin is excited to study the pain transmission pathways, and to help others with the recognition of pain in companion animals. Better understanding of pain sensation and its transmission, allows for improved patient care. Optimal patient care is the underlying goal of our dental and oral surgery service. Recognition of painful conditions in pets allows owners to seek the dental and oral surgery services to eliminate painful conditions. 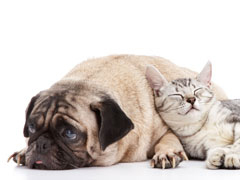 Animal Dentistry and Oral Surgery Specialists are committed to diagnose (the source of pain) and to treat optimally! Acute pain (rapid onset) can be a useful sensation to protect the body from harm. Pain allows the child to pull their hand off the hot stove burner to avoid further injury. Chronic pain is very undersirable and detrimental. View this technical schematic of the pain pathways as we understand them today. Please be patient, this is a large file but worth the wait. Enlarge the chart to read it.